The 9223-S Single-Channel 3G/HD/SD MPEG-4 Encoder provides a card-based solution for distribution of MPEG-4 encoding. Utilizing the openGear® open-architecture platform, the 9223-S offers scalable incorporation and the easy-to-use DashBoard™ setup and control operator interface. Up to 10 of the 9223 cards can be installed in a 20-slot frame, offering distribution delivery of up to 10 channels in a single frame, using less than 150W total, for reduced operating expenses. In addition to SD/HD-SDI inputs, the 9223-S provides the flexibility of supporting SD analog composite video and an analog audio stereo pair per input channel (using MPEG-1 Layer II audio encoding as standard). The 9223-S offers the latest advances in video compression that delivers excellent video quality at very low bit rates. Unique encoding designs allow delivery of multiple HD and SD video services simultaneously. 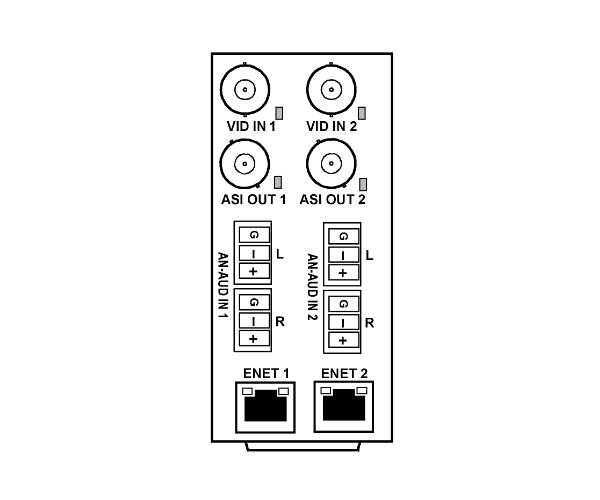 In addition to ASI outputs, the 9223 provides Ethernet outputs, supporting full-duplex 100 Mb/s and 1 Gb/s operation. Input video auto-detect mode allows encoding to automatically configure an output that correspond to the input, with resolution and frame rate same as input, and scaling set to same as input or other applicable choices. When using the Ethernet output, the 9223-S supports the traditional UDP/RTP/SPMTE 2022 FEC protocols, as well as the HTTP Live Streaming protocol for transmitting live video over the Internet. Using HTTP Live Streaming, the 9223-S can transmit broadcast-quality video to mobile phones (Apple and Android 4.0 supported), tablets, and a variety of consumer set-top boxes (such as the Amino A140 and the Roku Player). Full user remote monitor/control allows full card status and control access across a standard Ethernet network. Status monitoring is also available at card edge. 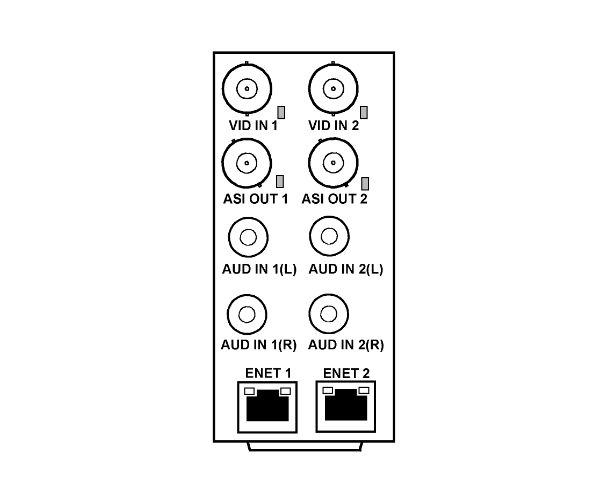 9223 encoders are also available in dual encoding channel configuration (some 9223-S models can be upgraded to dual-channel; see Options and Ordering Information). For info on 9223-D Dual-Channel 3G/HD/SD MPEG-4 Encoder models, please see 9223-D. The 9223-S is also available in stand-alone form factor BBG-1123-ENC. Additional Audio Pair License (+2A); allows an additional audio pair (from an SDI embedded pair) to be encoded along with base single-pair embedding. See Ordering Information for more details. Note: 9223-A8 models come standard with maximum audio channel capacity. +2A option cannot be added to these models. 9223-A8-S Single-Channel 3G/HD/SD MPEG-4 Encoder with H.264 SD. Support for 4 audio pairs (8-ch). 9223-A8-S-HD-I Single-Channel 3G/HD/SD MPEG-4 Encoder with H.264 SD/HD up to 1080i. Support for 4 audio pairs (8-ch). 9223-A8-S-HD-P Single-Channel 3G/HD/SD MPEG-4 Encoder with H.264 SD/HD up to 1080p. Support for 4 audio pairs (8-ch). 'licenses and require only one license per card. Note: 9223-S-A8 models come standard with 4 x MP1L2 stereo encoders for full eight channels of audio support in a single ordering option. You are currently requesting a quote for 9223-S.